Gallois is a French government advisor. PARIS (Bloomberg) -- PSA/Peugeot-Citroen appointed Louis Gallois, former head of planemaker Airbus's owner, as France's board representative at the carmaker following the government's move to help the company's bank unit. Gallois will take his seat on PSA's supervisory board after ratification at the annual shareholders' meeting on April 24, the automaker said on Tuesday. 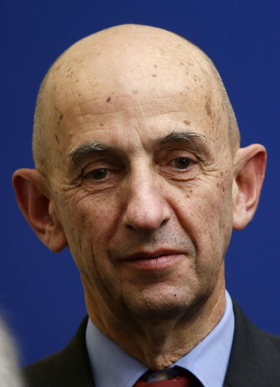 Gallois, 68, ran Airbus parent European Aeronautic, Defence & Space Co. for almost six years until May 2012. He published a report last month on France's business competitiveness that was commissioned by President Francois Hollande. The French state and PSA's labor unions each won board representation at the manufacturer as part of an agreement on Oct. 24 for the government to guarantee as much as 7 billion euros ($9.2 billion) in new bonds sold by the carmaker's Banque PSA Finance division. Debt at Banque PSA has the lowest investment grade at Moody's Investors Service, which said on Nov. 14 that it's reviewing whether to cut the rating because of the bank's ties to the car-manufacturing parent company. PSA's debt was reduced to three levels below junk at Moody's on Oct. 10. PSA said on Dec. 15 that it's close to completing a deal with a pool of banks to refinance debt at Banque PSA. Talks with lenders are "on track" and should lead to an agreement by the Dec. 25 Christmas holiday, Carole Dupont-Pietri, head of investor relations, said. PSA is taking steps to shrink its French automotive workforce by 11,200 positions, or 17 percent, over the next two years. The automaker is closing a factory on the outskirts of Paris, selling assets and working on a vehicle and component alliance with General Motors Co. as Europe's auto market shrinks this year to the lowest volume since 1995.